This summer, Courtyard by Marriott Dubai Green Community has the perfect solution to the sweltering Dubai heat. 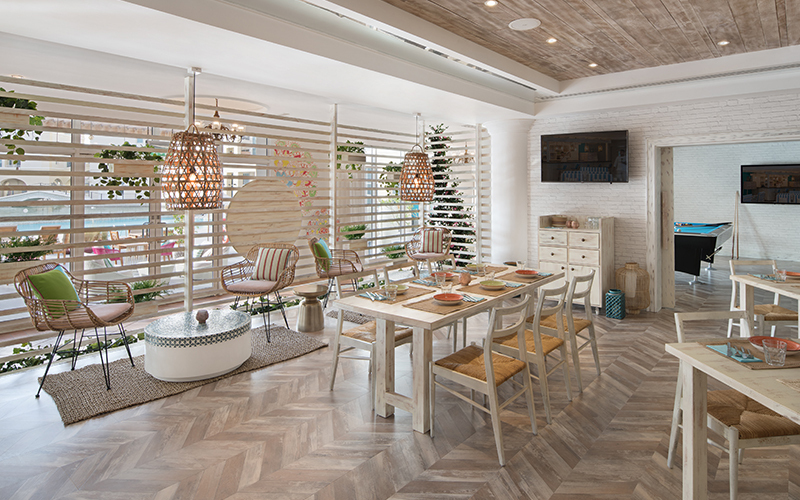 Over the hotter months the popular hotel has a rustic, chic new indoor edition of their poolside club SOBO. Catch some sunshade at SOBO, and then pop outside to get your tan on with free access to their temperature-controlled refreshing outdoor pool when you order any item of the menu from SOBO. 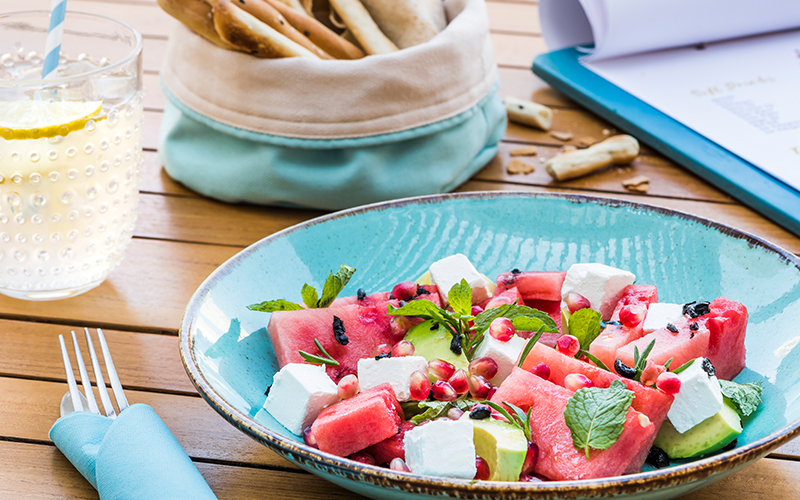 Favourites include the refreshing watermelon salad and the freshly grilled meats and seafood. Located just 15 minutes away from Dubai Marina and nestled within a cozy community with peaceful lakeside views, the hotel recently opened its doors to its contemporary, indoor edition of its existing Arabohemian poolside restaurant and bar, SOBO, so you can still enjoy the summer. The new SOBO design reflects the outdoor ambience right down to the T, consisting of earthy, wooden tones with an intimate atmosphere. The restaurant is decorated with a blend of pastel colours, and has beautiful potted plants enhancing the area with greenery. Visually pleasing and warm, the restaurant has a mixture of high and low seating and a dedicated bar area – great for catching up with friends over drinks or a solo lunch while digging into a book. The venue is also able to host lunch meetings in the relaxed setting – which is good for brainstorm sessions. During the day with views of the pool and lake, natural light fills the venue and in the evenings, the venue switches to warmer, mood lighting. SOBO will be open daily from 12pm to 1am, serving up a combination of Arabic flavours with dishes designed for sharing and socializing, reflecting a true family-style kitchen. Take our recommendation and start of your trip with the delicious warm, homemade bread and the oh-so-good beetroot hummus – we promise it’s good! Seafood lovers will enjoy the crispy calamari served with harissa mayonnaise, grand for a day when your heart just wants to dig into something fried on the outside and tender on the inside. The menu features a selection of meat, fish and seafood, marinated and freshly grilled including firm favorites such as the tasty shish tawouk, the succulent lamb kebab and delicious beef kofta, along with much, more. The launch event takes place on Wednesday 27th June from 8pm to 10pm. 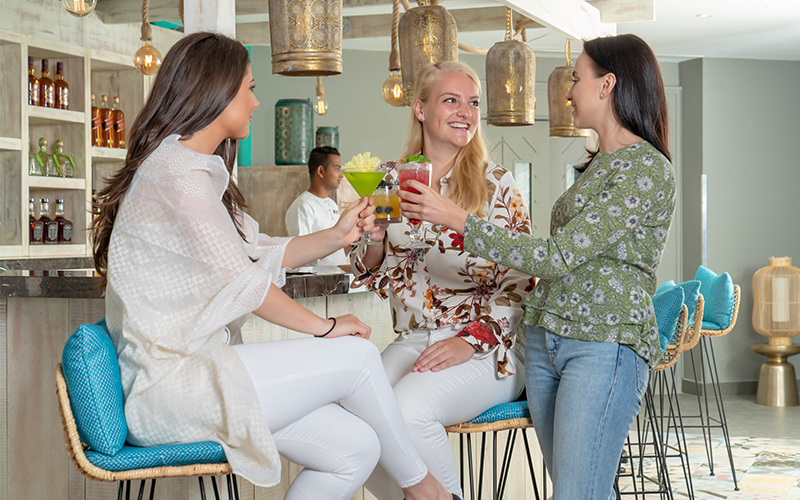 For AED 100, enjoy bites and free-flowing fizz with a DJ setting the mood. The very glam GlitterBox will be making an appearance, so ladies looking for a little pre-weekend sparkle, this is your spot. On the night, people will be able to take home a little piece of SOBO with them plus there will be prizes up for grabs through the night. Even better, pool access is open for all SOBO customers so you can enjoy a cool dip, sunbathing and just have to take a few steps to a delicious meal waiting for you inside. Details For more information, call T: +9714 885 2222 or visit SOBO. Visit Facebook or Instagram to stay posted.